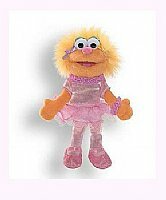 Zoe Sesame Street Full Body puppet is ideal for children and adults alike. She is 14â€� tall and loves playing with her best friend, Elmo. Zoe enjoys dancing, and especially Ballet.